Rabbit anti Human, Mouse Ki-67 SP6. A synthetic peptide from C-terminus of Human Ki-67. 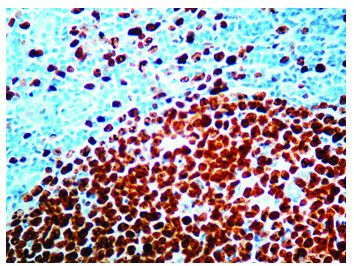 Immunohistochemistry on Paraffin Sections: Use Ki67 antibody at a 1/50-1/100 dilution in an ABC method for 30 minutes at RT. Also suitable for Western blot. 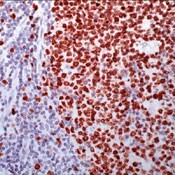 Ki-67 antigen is expressed in proliferating cells but not in quiescent cells. Expression of this antigen occurs preferentially during late G1, S, G2, and M phases of the cell cycle, while in cells in G0 phase the antigen cannot be detected. 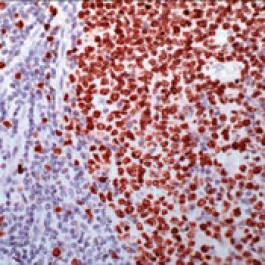 Consequently, Ki-67 antigen expression is used in tumor pathology to detect proliferating cells in neoplastic diseases. In cultured cells, Ki-67 is expressed in the nucleolus of interphase cells. The Ki-67 gene contains 15 exons. The Ki-67 repeat region, within which there is a 22-amino acid Ki-67 motif, is encoded by exon 13. The shorter isoform lacks exon 7. Northern blot analysis re-vealed multiple transcripts ranging from approximately 8.9 to 12.5 kb in proliferating but not quies-cent cells. Immunoblot analysis showed expression of 320- and 359-kD proteins. Sequence analy-sis predicted that the short-lived 2,896- and 3,256-amino acid protein isoforms contain potential nuclear targeting signals, over 200 potential phosphorylation sites, 19 N-myristoylation sites, 3 amidation sites, and numerous PEST sites. Antisense oligonucleotides inhibited cellular prolifera-tion in a dose-dependent manner, suggesting that Ki-67 protein expression may be an absolute requirement for cell proliferation. 1. Tüzel E. Spontaneous corpus cavernosum abscess in a healthy man using long-term androgenic anabolic steroids. World J Mens Health. 2015 Apr;33(1):36-8. doi: 10.5534/wjmh.2015.33.1.36. Epub 2015 Apr 23. PubMed PMID: 25927061. 2. Lee W, Son Y, Jang H, Bae MJ, Kim J, Kang D, et al. Protective Effect of Administered Rolipram against Radiation-Induced Testicular Injury in Mice. World J Mens Health. 2015 Apr;33(1):20-9. doi: 10.5534/wjmh.2015.33.1.20. Epub 2015 Apr 23. PubMed PMID: 25927059. 3. Goyvaerts L, Lemaire K, Arijs I, Auffret J, Granvik M, Van Lommel L, et al. Prolactin receptors and placental lactogen drive male mouse pancreatic islets to pregnancy-related mRNA changes. PLoS One. 2015 Mar 27;10(3):e0121868. doi: 10.1371/journal.pone.0121868. eCollection 2015. PubMed PMID: 25816302. 4. Jeong YJ, Jung MG, Son Y, Jang JH, Lee YJ, Kim SH, et al. Coniferyl aldehyde attenuates radiation enteropathy by inhibiting cell death and promoting endothelial cell function. PLoS One. 2015 Jun 1;10(6):e0128552. doi: 10.1371/journal.pone.0128552. eCollection 2015. PubMed PMID: 26029925. 5. Yoon JH, Seo HS, Lee J, Moon C, Lee K. Acute high-level toluene exposure decreases hippocampal neurogenesis in rats. Toxicol Ind Health. 2015 Oct 16. pii: 0748233715599087. PubMed PMID: 26475279. 6. Lee, B;, ;Oh, J;Seo, M;Hwang, J;Yoon, B. Expression of p63 and its association with cell proliferation at different stages of murine hair follicle cycle. J Biomed Transl Res 2018, 10-15, 19,1.